Where Did the Expression "Let the Cat Out of the Bag" Come From? Where Did the Expression “Let the Cat Out of the Bag” Come From? 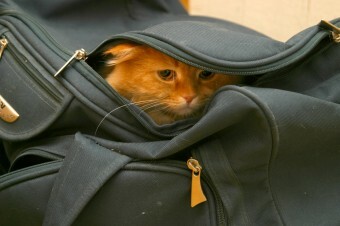 Ryan asks: Where did the phrase “let the cat out of the bag” come from? The famous humorist and writer Will Rogers once said, “Letting the cat out of the bag is a whole lot easier than putting it back in.” But where did this expression come from and why is it used in this way? For those who aren’t familiar with the saying, the idiom “let the cat out of the bag” means to reveal a secret or disclose facts that were previously hidden. It can also be used to refer to someone who is a “blabbermouth.” The saying provides quite the visual – a cat, playing the part of the “secret,” sprinting out of the “bag,” playing the role of where the secret was hiding. Much like a cat that was once trapped in a bag, once that secret is out, it’s never going to go back into that bag again. The first recorded use of this phrase comes from a book review in a 1760 edition of London Magazine (which is still published today). The reviewer complains that, “We could have wished that the author had not let the cat out of the bag.” Taking from the context, it seems that the reviewer wished the author had not spoiled a surprise or secret in the book. According to the Phrase Thesaurus, there were several instances of this expression being used during the late 18th century in literature, often with quotations around the phrase, potentially indicating that it was a newly coined expression. Thus, as this particular origin theory of “let the cat out of the bag” goes, the unscrupulous sellers would sell the “pig” in a bag, but instruct the buyer not to open it until they get home, lest the pig escape. The buyer would carry a wiggling bag all the way home, only to have it revealed when opened that they had received a feral cat instead of a piglet. As one could imagine, feral cats were worth (and probably still the case today) far less than a piglet. Another version of this history involves the dishonest businessman physically switching the piglet for a cat while the customer turned away. Either way, it ended with letting the cat out of the bag and the secret being revealed that the customer didn’t have a piglet. Obviously this explanation of the origin of the idiom seems rather implausible. For one, piglets tend to be a lot heavier than even the fattest of cats. To quote Matt Soniak of MentalFloss, “I have a cat fat enough to have earned the name “Oink,” and even he looks svelte next to a suckling pig.” Additionally, pigs squeal and oink, while cats hiss, meow, and claw. It would be pretty hard for even the stupidest of buyers to mistake a pig for a cat. The Spanish equivalent of this phrase giving a potential origin is slightly more plausible, but still a stretch. “Dar gato por liebre” more or less means “to give a cat for a hare.” Hares were commonly eaten during the 14th and 15th centuries. At least in terms of size, a cat and a rabbit are more similar to one another than pigs and cats. To pull the switcharoo with a rabbit for a feral cat at least seems plausible. Then again, the whole hissing and clawing thing would still be a dead give away, so color me skeptical. Another possible explanation for the origin of this phrase, this one at least somewhat plausible, stems from Britain’s infamous Royal Navy. Sailors would often get in trouble with their superiors. In order to keep these salty seamen in line, the Royal Navy would employ the help of a cat o’ nine tails, a whip with nine knotted cotton cords that could inflict pretty serious damage onto one’s back. The “cat,” or sometimes referred to by it’s other nickname “the captain’s daughter,” was often kept in a red cloth bag, as a symbolic gesture, as well as keeping it from drying out due to the sea air. The one slight problem with that origin theory is that it doesn’t really show how we got from that to something not being able to be put back in a bag afterwards, which is central to the way the expression was used when it first popped up, and even today. You could say the cat o’nine-tails doesn’t go back in until a whipping has been administered, but it still goes back in the bag easy enough. It’s possible that the meaning simply morphed over the course of the early 18th century to when the first documented instances of “let the cat out of the bag” popped up, but there is no documented evidence of this evolution, so we can’t know for sure. As you can tell, there seems to be little consensus on the origin of the idiom. In the end, the most likely explanation could simply be that it derived from a slightly more literal origin with no connection to trickery or metaphors; after all, it really is amazingly difficult to force a cat back into a bag they were trapped in after you let the animal out, as Will Rogers observed. Where Did the Phrase “Take a Gander” Come From? The London Magazine is actually still in existence and publishing today. Its first edition was in 1732. Many legendary writers contributed and to the publication over the nearly four centuries the magazine has been around, including Jack London (“The Call of the Wild), Ruth Prawer Jhabvala (Academy Award winning writer of “A Room with a View”), John Keats (legendary English poet), and Sir Arthur Conan Doyle (“Sherlock Holmes”). Catwoman, one of DC’s Comics signature female superheroes, uses the appropriately-titled cat o’nine tails as her signature weapon. Thank you for a well written article. Probably much related, in Dutch, there is a saying ‘een kat in de zak kopen’, which translates as: ‘buying a cat in the bag’. It means buying something which has a hidden fault. This seems to originate from back in the days when the skin of cats was still used for the making of furcoats. As app only black cats were suitable for this, a trader should always have checked what kind of cat he was buying, otherwise he would have bought a faulty ‘product’, a cat in the bag. Could very much imagine this relating to ‘letting the cat out of the bag’, but just my 5 cents worths. Regarding the spanish expression, the explanations I’ve read/heard before (seem more plausible but also way more disgusting 🙂 ) is that the cat were prepared and served instead of a hare in a dish. In “dar gato por liebre” the ‘giving’ might not refer to the cat in the market but to the cat given as a meal being passed for a hare. The chinese equivalent expression (according to Wikipedia) for ‘Pig in a poke’ mentions something on dog meat. In any case, those don’t have to do with “cats in bags”, so this was more of a clarification. Similar to Roberto, the caution I’ve heard about cats and hares has to do with the butcher. It’s said that a skinned cat and a skinned hare look almost alike, especially without heads (ears) and feet. Ick. I was wondering however if the saying originates to ritual occultist practices found in Europe which involves ritual sacrifice of animals (as well as humans) on “magically significant” dates kept by people who practice such religions. The phrase don’t let the cat out the bag referring both metaphorically to keeping the religious orders secret while at the same time also meaning literally, as people whom were are not part of such religions who perhaps hold religious beliefs that are diametrically opposed to those involved in occultism would surely reacted to their practices of ritual sacrifice. A more sinister origin could be from the practice of burning religous martyrs at the stake. . The practice of putting cats in bags around the fire was used to frighten the populous even more, because as soon as the cats felt the heat from the flames they would scream and wail in a horrible manner, much more than the actual martyr. Some cats escaped from the bags never to be seen again.